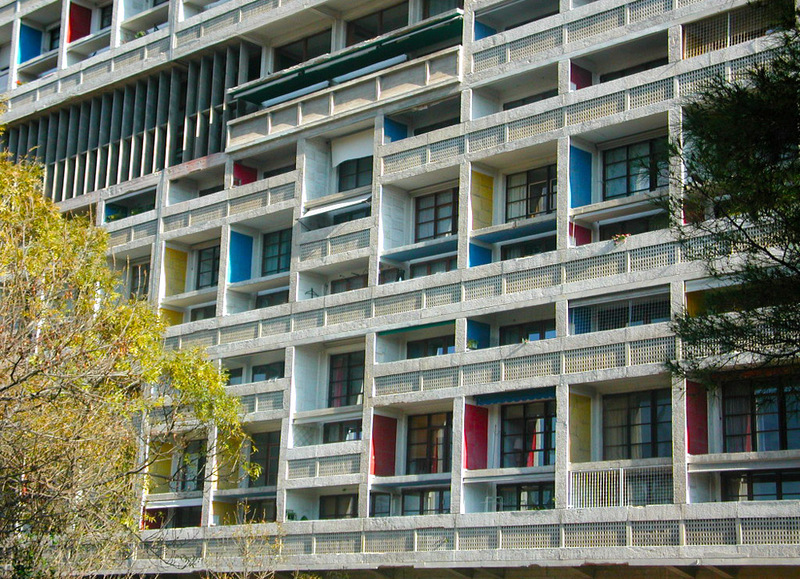 The Marseille unité d'habitation brings together Le Corbusier's vision for communal living with the needs and realities of post-war France. 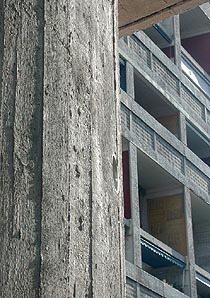 Up to 1600 people live in a single-slab 'vertical village', complete with an internal shopping street halfway up, a recreation ground and children's' nursery on the roof, and a generous surrounding area of park land made possible by the density of the accommodation in the slab itself. Most of Le Corbusier's 'five points of architecture' from the 1920s and the Villa Savoye are alive and well in the Unité: the strong pilotis creating circulation space beneath, the free facades now loud with a carefully orchestrated pattern of single- and double-height balconies generated from fifteen different types of apartment, and the roof terrace reclaiming the lost land beneath the building for recreation. The plan is no longer completely free: the partition walls between the apartments are load-bearing, freeing the facades, and providing strong sound-proofing between apartments - part of the building's success in combining privacy with communal living. But between these walls, the free plan has taken on a new dimension, to become a 'free volume'. 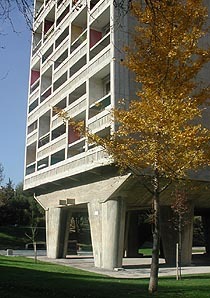 In an ingenious use of space, two-story apartments interlock, so that an entrance corridor and elevator stop are required only at every third level. 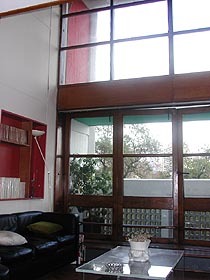 On one side of the corridor you may enter an apartment's lower level, taking up one side of the building, and climb the stairs within the apartment to a double-aspect floor of bedrooms above; on the other side of the corridor you may enter the neighboring apartment's upper level, and descend to the double-aspect floor below. As a result, apartments typically combine bright, double-height sitting rooms on one level, with long, narrow bedrooms on the other. 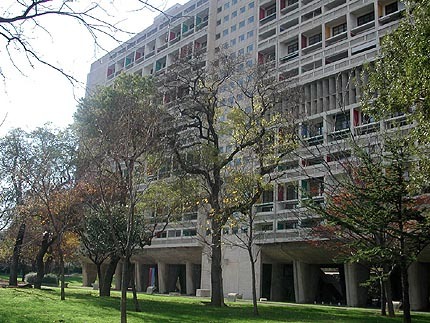 The Unité d'habitation is at the southern edge of Marseille, on the west side of boulevard Michelet just south of the Prado junction. Parking is available within the building's grounds. Without a reservation you can see the building from the gardens and take the elevator to the ninth floor for the roof terrace. 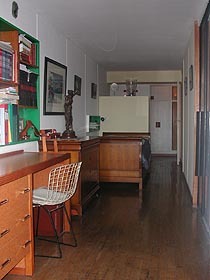 By appointment you can arrange to see an apartment preserved and furnished as it originally was in the 1950s - try calling the building on +33 4 91 77 81 74, but you may not get an answer. 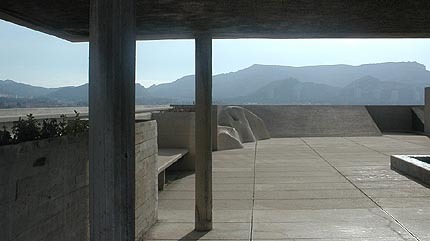 Alternatively arrange your visit to the apartment through the Hôtel Le Corbusier. 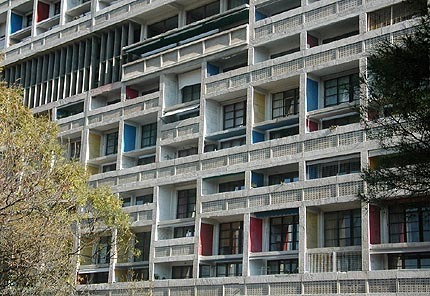 You can stay within the building at the Hôtel Le Corbusier, half-way up the building on the 3rd floor (actually the seventh level, but as described above only one in three levels is a numbered floor). 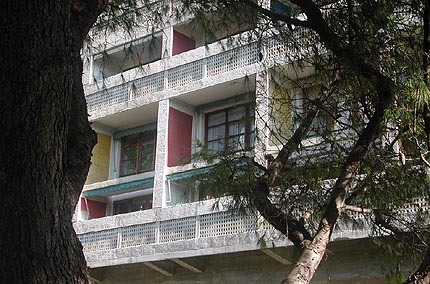 Part of Le Corbusier's vision of communal living in the building was an area of 'spare rooms' that could be rented for visitors; that now constitutes the Hôtel Le Corbusier, and is frequented mostly by architecture enthusiasts. Viewed as rented 1950s spare rooms the accommodation is excellent; viewed as twenty-first century hotel accommodation it is more modest, but clean and comfortable with friendly service (two stars) and a good opportunity to experience the building. 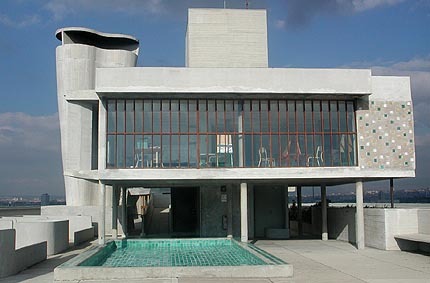 You can call the Hôtel Le Corbusier on +33 4 91 16 78 00 or visit www.hotellecorbusier.com.